Because i'm an 18 year old dude and when you're my age looks matter more. Would I break up with a girl who was balding? Probably not. If we have been dating for a couple of months, then chances are I will like her as a person and we actually get along so even if she was balding I woudn't break up with her for that. I woudn't initially be attracted to bald chicks honestly. Only if they look like Natalie Portman. Given the choice between Cass Eliot and hairless Sinead O'Connor. I'd choose Cass Eliot. I'd much rather have a bottle in front of me than a frontal lobotomy. That woman doesn't look to be bald or balding. She has simply shaved her hair rather close to the scalp. There is a girl in the other thread who wouldn't date a bald man as well (and baldness in men is natural) - Now, we're even ;p.
Another question that somewhat proves if we are "shallow" or not. Another subtle way to bypass the admins of purposely "busting our balls." I love a nice hair-do on women. I would never pick up on a bald chick. If she's not a cancer patient or has some medical disorder, she is just craving attention...not my type. If I was with a girl who went bald...there always fake hair she can get implanted. I agree, long hair adds character or I have long hair because it breaks away from uniformity but I feel like a girl might have a certain haircut to be an individual or break away from conformity so in that same sense I could be understanding towards that. I do think short hair looks good on some girls. I would never pick up on a bald chick. If she's not a cancer patient or has some medical disorder, she is just craving attention...not my type. *sigh* This is why I haven't shaved my head again yet. Because it is "attention-seeking" and I'd stand out too much. I really want to shave it, because it is so easy to manage! That's really the reason (and to raise money for the Leukemia Foundation). But I feel like most people will think I am attention-seeking. I just wish shaved head on women was more common, so I could feel comfortable doing it too. She could have been balding though, but judging from the vibe she gives, probably isn't I guess. I won't mind, as long as I'd befriend her. That doesn't bug me anyway. If a man is bald or balding it's just considered one of the many variations in physical appearance of man. It's merely a preference one way or another if you don't find appeal in them. 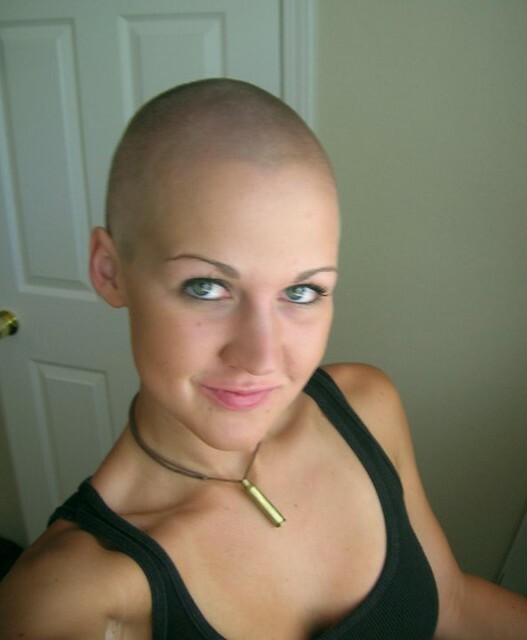 If a woman is bald she's thought of negatively and seen as repulsive. Not only is she not preferred, people make negative comments when they see her. That is the difference and the double standard. This is, unfortunately, how the general population sees any 'alternative' hairstyle a woman chooses. I, myself, am about 2 months into dreadlocking my hair, and it's amazing what people think.